OK it has been a while, but I am not in the mood to post lately. So here are a few things of what has been going on! I always bleach the boys hair for the summer. Mason was not too thrilled about this but Cache loved it. Mason's did not turn out as good as Cache's. Cache looks so cute with his big blues. York has been busy with soccer and just being a teenager, driving Eric and I crazy! He did make Murray Max which I was really happy about. It will be a great time consumption and ego boost for him. Dylann oh little Dylann. She is all boy wrapped up in a girls body! It scares me! We went to the park the other day and Mason went down the fireman pole. Well I guess she thought she could do it too, and luckily a mom there grabbed her before I could get to her! Then Eric and I took the kids swimming at the Rec Center. She would just take off into the deep end even though she was getting whisked away and here nose was about covered. I took her down the big water slide on my lap which scared the crap out of me because she came out of my arms once but I caught her. When we finally hit the bottom she was ready to go again. She was pist that Eric or I would not just keep taking her down. Mason is in a summer camp and likes it a lot. Last week he got to meet some firefighters and climb on the truck. He loved it because he wants to be a firefighter like his Uncle John. Which would make Uncle John really happy someone followed in his footsteps! Cache is just Cache and is as wild as ever. We have managed to loose another mold, well the dog ate it. He will be getting his own set of hearing aids in the next week. I am excited. We finally put some heavy duty locks on the doors so he has no way to escape now! That about it for our uninteresting life! I wish I had more! Oh I did apply to go back full time but we will see and I did find what I think will be a perfect babysitter! She even knows sign language! It is crazy how things turn out! So I read this and had to post it! Although I am not in my 30's yet... I am pretty close and I totally inderstand this! Thirty, I can't help but look around and notice the youth of today. Childhood, you live in a damn Utopia! Don't know how good you've got it! Look it up ourselves, in the card catalogue!! Somebody a letter, with a pen! Put it in the mailbox and it would take like a week to get there! Steal music, you had to hitchhike to the damn record store and shoplift it yourself! Beginning and @#*% it all up! Were on the phone and somebody else called they got a busy signal, that's it! To pick it up and take your chances, mister! Faster and faster until you died! Just like LIFE! Use the stove or go build a frigging fire ..
Today have got it too easy. Five minutes back in 1980! Yes I am really late on this post! It has been very busy! Caches B-day was the 18th! Although we did not celebrate his b-day on his b-day he still had a good one! I won't go through Caches arrival to the world because if you read my blog you will see it right. As I've said, he is my little hero! He is such an amazing kid and I feel so lucky to have him! Although at times my very mischievous child will send me to my limits I still can't help but to smile at him! At any given time you will see Cache wondering out my front door with no one trying to sneak away! Lucky for me I have great neighbors who look for him and seem to bring him back in the 5 minutes that I have turned my head! I really need to get a sign out front that says deaf child! Side note to self-check into that! 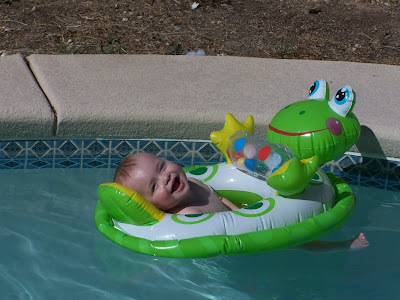 Cache chilin in our pool in Vegas! Cache has had such a great year and has come such a long way since we first moved back! When we moved to from Vegas Cache was only 18 months. He was not walking, talking, and definitely was not where he was supposed to be! After much work, a new pediatrician, and months of worries Cache had finally been diagnoses with being deaf. Which was no surprise to us. The funniest thing about it all is when the first audiologist told me that he was deaf I was relived! 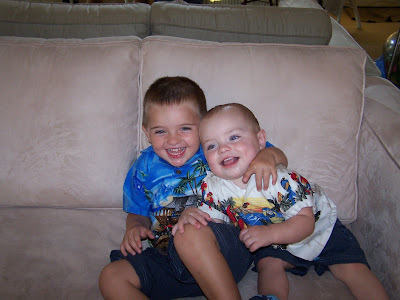 See there was so much worse he could have... we went from a brain tumor (the scariest and I will never forget braking down at work after coming down from the oncology unit), to autism, to deaf. The audiologist kept telling me it was ok to cry and I wanted to laugh right at her! Deaf, honey I have been through hell with this kid, deaf was nothing! 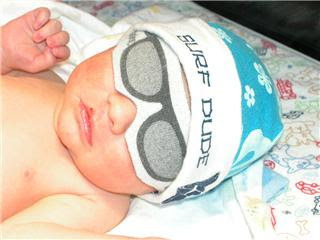 Cache when he was in the NICU after he was born, he got to wear shades! Cache has hit so many mile stones in this last year. He started walking at about 20 months but is still uneasy on his feet. You will always find some bruise on Cache because he falls all the time. The poor kid looks like we beat him sometimes! And we are always yelling at him so he can hear us which we now tend to do with the other kids! I am sure my neighbors think we are crazy! Since he has started school he has also grown so much! He rides the bus everyday and he loves it. He is starting to Babel like a baby which makes things nice because he used to just scream. He will copy your words and although he may not get it out right he will have the same amount of syllables. Cache has an incredible smile and amazing eyes. It will melt your heart! I am looking forward to the next year to see him grow more like he has this year. 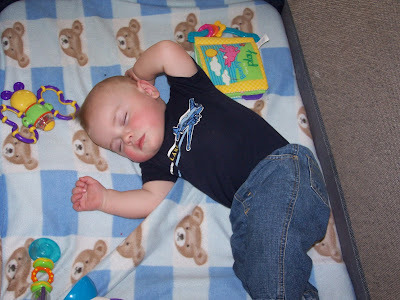 Cache used to fall asleep in the middle of the room when he was little even if there was a million things going on! 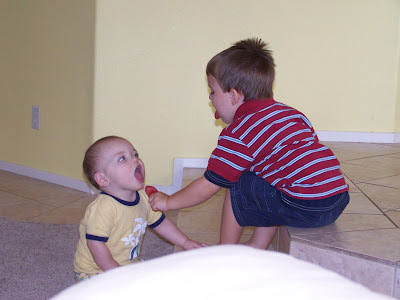 Mason showing his little Bro how to eat a Popsicle. Happy Birthday my little Hero! So I decided I have no time for this! I am going to retire it for the summer! I think it is a winter activity! I will still post great events which I still need to do but I will not be posting much as you can see! I am just not in the mood with the sun out and shining! I will post about once a week! That is as good as it gets!